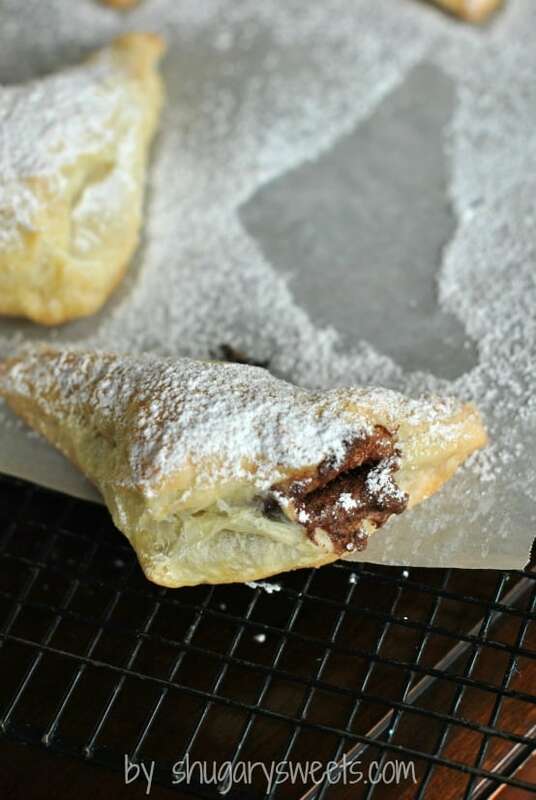 These turnovers are made super simple by using Pepperidge Farm Puff Pastry! 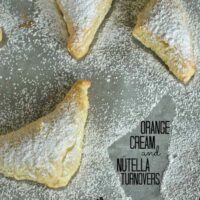 Half are made with Nutella and the other half are made with a Creamy Orange Cheesecake filling! You decide your favorite. I love making a simple treat that is so impressive. It makes me look like a rock star in the kitchen. 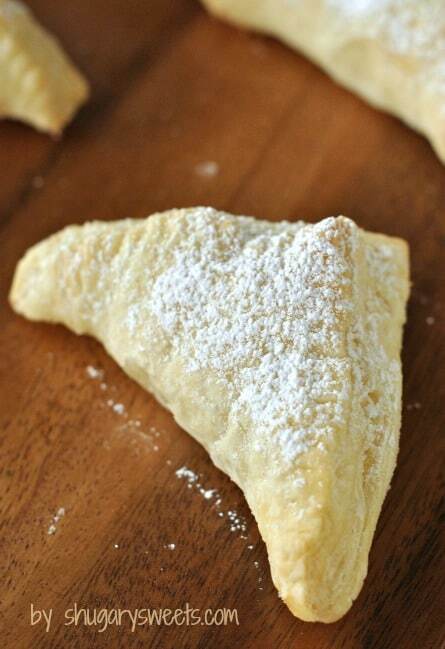 I made these turnovers for my Bible study group last week, and they seemed to be a hit! But even a bigger hit when my kids got home from school and saw a tray of them were leftover! 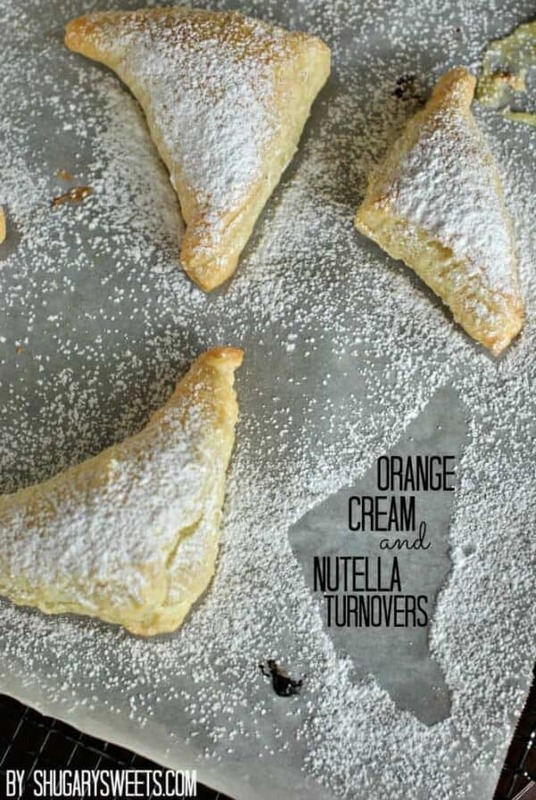 When it comes to making turnovers, there’s something so elegant about them! First you need to thaw your puff pastry. Using the guidelines on the package, thaw on your counter. Once thawed, unfold each sheet of puff pastry (there are two sheets in a box). Cut each sheet into 9 equal portions, for a total of 18. For today’s recipe I made half of them Orange Cream and half of them with Nutella. To 9 of the squares, add about 1 Tbsp of Nutella to the center. Fold into a triangle and pinch the edges. Lay each triangle on a parchment paper lined baking sheet. 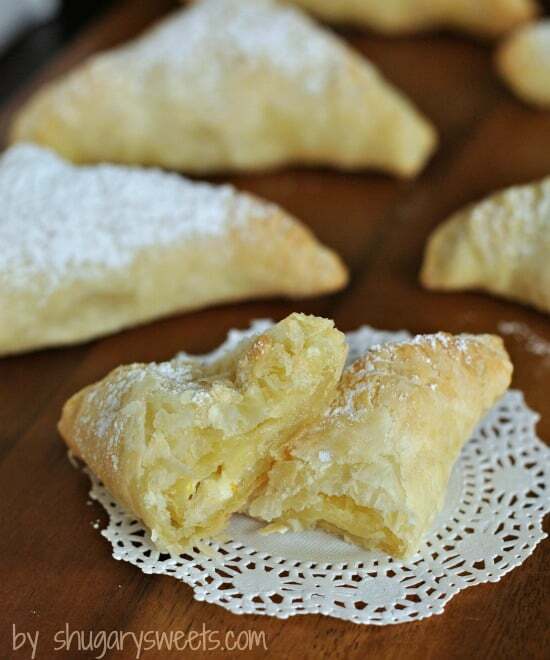 For the orange filled turnovers, beat cream cheese with sugar and orange zest for about 2 minutes until creamy. Drop about 1-2 Tbsp into the center of the remaining squares of puff pastry. Fold into triangles and pinch edges. Lay on parchment paper lined baking sheet. Bake for 15 minutes. Remove from oven and sprinkle immediately with powdered sugar. These taste best in my opinion while warm. These Rosemary Garlic Breadsticks are so quick and easy and perfect with your dinner! How about making some individual Quiche for your family? These are delicious and freeze well too. Pull a few out for breakfast! Strawberry Struedel: this homemade toaster struedel recipe gives Pillsbury a run for their money, and it’s so easy! Thaw puff pastry on counter according to package directions. Unfold each sheet and cut into 9 equal squares (a total of 18). To 9 of the squares add about a tablespoon of Nutella to the center and fold into a triangle. Pinch the edges. Lay each triangle on a parchment paper lined baking sheet. Beat cream cheese with sugar and orange zest for about 2 minutes until creamy. Drop by tablespoon to center of remaining squares of puff pastry. Fold into triangles and pinch edges. Lay triangles on parchment paper lined baking sheet. Bake turnovers in a 400 degree oven for 15minutes. Remove from oven and sprinkle with powdered sugar. Oh my I can’t decide which I would like more! Guess I should make both! Yum! They both are delicious. I enjoyed switching off!! Great idea. I’m mixing both flavors together when I try these. After we ate them I though mixed would have been a delicious combo too! So you’re killing me. Those sound so amazing. Who would have that to put that together but it is a great combo. 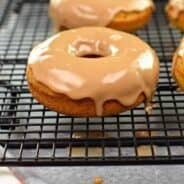 the orange cream ones sound so yummy i might just have to make them for my next “cheat” event. The orange were delicious Pam!! So good that I’m making them again this week! A combination would be delicious too, I’m sure! Thanks for stopping by Liz! These look irresistible! I’ll take two dozen of each! Do we really have to chose just one? I’ll take two ….of each! Oh.my.word.Aimee!!! I love the simplicity of these – and orange cream?! YUM!!! I think I just woke up my daughter by screaming “get in mah bellah” too loudly. It just happens, especially when I see deliciousness like this. Gorgeous photos lady. The one with the missing turnover is stunning. haha, love that! Thanks for the sweet words, I’m still a work in progress when it comes to photography! I love your first picture! Easy and also impressive desserts are my favorite. This sounds like a wonderful one! Oh my! There’s nothing in comparison to a marriage between chocolate and orange. Yummy! Nutella and cream cheese sounds good 🙂 Too bad I finished Nutella on weekend. Oh you need to replace that soon!! Hard to decide which sound better and so, yes, I will be trying both. What a fun idea! Yum! Thanks Dorothy! They were delicious!! This HAS to be the best thing I’ve seen all day…the next time I’m baking, I’m making these! Oh my, these looks so perfectly soft, flaky and delicious 🙂 awesome flavors! Yum, both fillings sound wonderful – but I will have to take the Nutella! I remember eating apple turnovers as a kid like they were going out of style. I’d say these have those beat by a few hundred miles. The orange cheesecake filling sounds amazing. I think, considering the season, I’d have to give those my vote. I love using puff pastry to make turn overs. 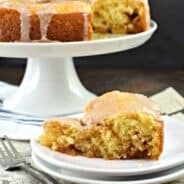 Usually I make an apple filling (because it reminds me of German Apfeltaschen) but either Nutella or orange cream cheese sound amazing as well! You really can’t go wrong with anything wrapped in pastry! These look awesome! Aww, sooo sugary and sweet indeed! I am drooling now, thank you so much for being so generous in posting this, I really appreciate it that I can now try this at home, kudos! I am so in love!!! Wow..wow..wow!!! Thanks Cathy!! 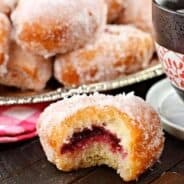 they are so delicious, and incredibly easy!